CINCINNATI -- “This is not the right answer for the gas problem,” Pleasant Ridge Community Council President Bill Frost said of the proposed Duke Energy pipeline in June 2016. Thursday night, despite revisions from Duke, a reduced pipeline size and a new set of proposed routes, the verdict from many Evendale residents was the same. “I’ll show you where the line will come, and you will understand,” said Cenalo Vaz, who attended a town hall meeting about the pipeline with his wife, Mary. "It's amazing to me that Duke would put a line of this pressure in such a highly populated area." One proposed route for the 20-inch pipeline would put it just 155 feet from the Vaz’s home -- a distance that members of the group NOPE (Neighbors Opposing Pipeline Extension) believe would place the Vaz family at risk of harm if the pipeline were to malfunction. Duke has maintained they would operate the pipeline safely. They already operate more than 14,000 miles of natural gas pipelines, including 250 miles of high-pressure pipelines, in Ohio and Kentucky, and a company representative said Thursday the new pipeline was essential. "What we want is to make sure we are informing customers about how natural gas is safe," said Sally Thelen of Duke. "It’s a very safe commodity and certainly something we don’t want customers to be afraid of. I do think there is still a lot of misinformation and mis-truths out there about the project." 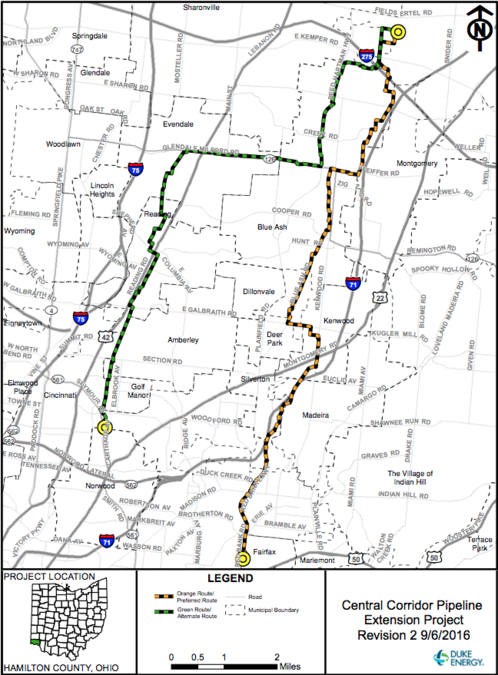 Duke Energy will hold a fourth open house about the pipeline project Jan. 26 at the Crowne Plaza Blue Ash.